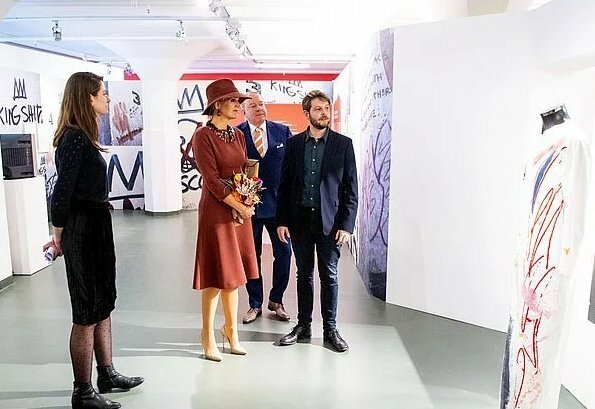 On January 31, 2019, Dutch Queen Maxima attended the opening of the exhibition "Basquiat – The artist and his New York scene" at the Schunck museum in Heerlen. The exhibition tells the story of the work and life of the young Basquiat from his period in New York between 1978 and 1982. Jean-Michel Basquiat is an American graffiti artist and an expressionistic painter. Basquiat became famous in New York firstly as a graffiti artist, then he started to make expressionistic paintings in 1980s. The painter became the first Afroamerican painter who has an international recognition. I may not like the necklace, or the shape of the hat, but that's jus personal preferences. 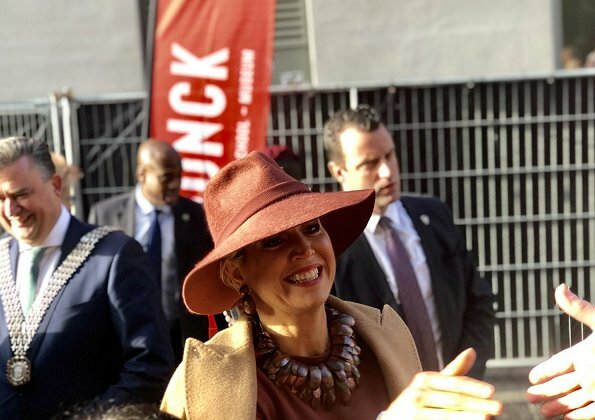 She looks fantastic, there goes Máxima, original, vibrant, self assured and gorgeous. Bluebell X, woman do wear hat indoors, it's proper etiquette, removing headgear only applies to men. 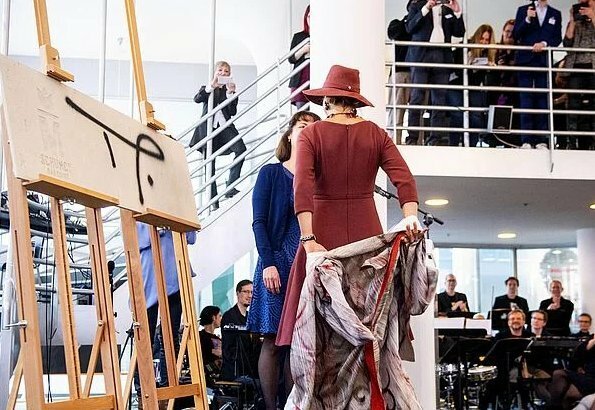 I learned that rule (women wear the hat as part of the ensemble indoors) too. What I would like to know from the fashion experts: What about a beret? Like Faye Dunaway in "Bonnie and Clyde". It has the same function as a hat, hasn't it? In constrast, a cap against the cold is taken off, isn't it? This dress has a great cut for her body type. So flattering! Interesting colour as well. 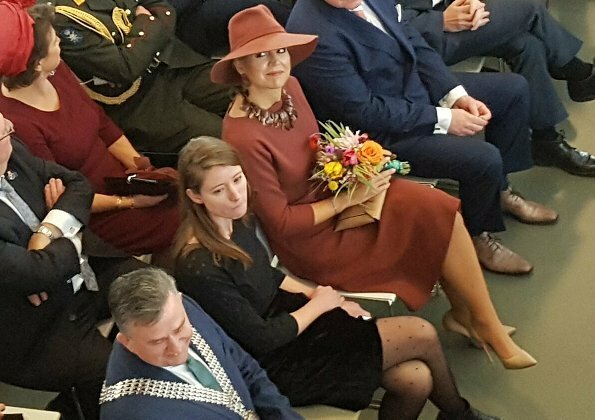 I do like the hat, but wouldn´t have combined it with the dress. It would have worked better with a more casual outfit, ideally with trousers. 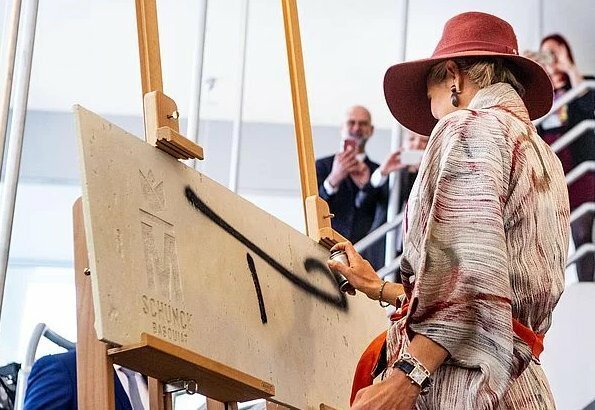 Beautiful Queen Maxima, it´s made for her.